Robertas Beinaris is an oboist, art licentiate (2003) and artistic doctorate student (2013-2014) at the Lithuanian Academy of Music and Theatre (hereafter LAMT). 2002-2003, the oboist did his internship in the national conservatoire in Lyon (France) (the class of J. L. Capezzali and J. Guichard). Pedagogue at the LAMT (since 2011 – Head of the Winds and Percussion Department, since 2012 – an associate professor) and the Vilnius Balys Dvarionas Music School. Since 2000, he has been a member of the chamber ensemble Musica Humana of Lithuanian National Philharmonic Society. As a member of many chamber ensembles and as a soloist, too, he has performed in Germany, Italy, Austria, Latvia, Estonia, Denmark, Sweden, Switzerland, Norway, France, Russia, Ukraine, Belarus and Poland. Robertas Beinaris played solo with the symphony orchestras of the Orchestra dellaToscana, the Tiroler Symphonie Orchestra Insbruck, St. Petersburg, the Lvov Philharmonic orchestra, the European Students’, the Lithuanian National Symphony Orchestra, the Lithuanian State Symphony Orchestra, the Kaunas city Symphony Orchestra and the symphony orchestra of the LAMT students; the chamber orchestras of Lithuania, of the Soloists of Kiev, of Klaipėda, Šiauliai, the St. Christopher’s Chamber Orchestra of Vilnius; as well as with the orchestras of the Hundisburg International Academy, Kremerata Baltica, Camerata Klaipėda, Čiurlionis Quartet, Kaunas String Quartets. He often persuades Lithuanian composers to create new pieces for oboe and then performs them first. 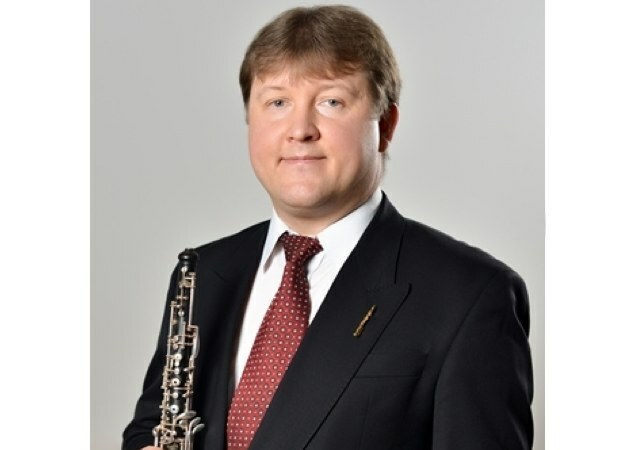 Since 2005 he organises the championship of Lithuanian oboists, the international oboe competition of Liutauras Vėbra; he is the art manager of the International Oboe Festival and since 2008 – of the International Competition of Chamber Orchestras “Musical Aquarelle”. He has been awarded a medal for the merits to the town of Anykščiai and the badge of the Old Varėna. R. Beinaris often works with young talents for the Mstislav Rostropovich Charity and Support Foundation. He is the founder the leader of the Oboe Quintet of Lithuania. In 2008 R. Beinaris and the quintet won first place at the VIII the International competition “Music Without Boarders”. R. Beinaris took second place at the J. Pakalnis Young Performers’ competition in 1995 and first prize at the International Jurijanu Andrejs Wind Instruments competition in 2001. In 2009 he won first prize as the best soloist at the Lithuanian Championship of wind ensembles. The discography of this musician includes 10 CDs with various ensembles and solo pieces performed by R. Beinaris. The activity of R. Beinaris is not limited only to performing music – he makes reports on music subjects (Latvia, Lithuania), and writes articles for culture editions. In 2014 he was given the degree of Doctor for his dissertation “The oboe acoustic technological possibilities and innovations of modern expression”.